We never thought we’d have to say good-bye to Ciega when just a short week ago, we were sedating her for a possible abscess. But our vets quickly discovered the lump was consistent with cancer and the biopsy confirmed this. The mass had metastasized and spread to her lymph nodes and one lung, causing a respiratory issue. As the days passed, it was clear it was time to let Ciega go. I want to be strong the way Ciega was. She was a girl that confronted life with confidence and had beaten all the odds, except this last one. But the reality is, I’m a sobbing mess right now. Anyone that knows Ciega knows why. She was so special in every way. Though we never want to see any of our residents move on to their new wild life, when it’s time, some you just have a harder time letting go. I know you know the feeling. You’ve lost an animal you loved and adored, too. So you understand the hours you replay every moment in your head, hoping and wishing the news and outcome were different. Wondering why this had to happen to her. If it could’ve been avoided and beating yourself up for not knowing sooner. You pray the more you hug and kiss her, the longer she’ll stay. The more you research, you hope you’ll be the one to find the answer to save her. Because you can’t imagine a day without seeing this beautiful girl who makes everyone smile. A girl who never complained, not even when cancer had taken over her body. Ciega spent every day inspiring those around her. 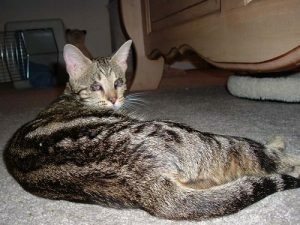 Though she was blind from birth, you’d never know it. She chased butterfl ies, climbed perches, and had a sixth sense. She never pitied herself or saw herself different from her bungalow friends. 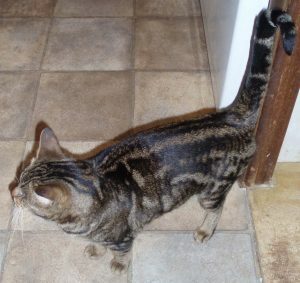 Well, maybe a little – she always acted as though she was better than other cats. But she sure loved her humans – all of them. Ciega has been with me since she was a kitten surrendered for not using a litter box. She is as close to me as my founding cats. But I know she’s just as close to those that have known her for only a few years or only a few months. Ciega made sure she filled everyone’s heart she met. That’s why her loss is not only devastating to me, but to all who know her. And on top of our other losses, it can feel like we’re under a cloud we’ll never get out of. I know I can move forward without her – I have to and my head knows that. But my heart doesn’t want to – my heart just wants her back with us. When I feel this way I need to turn my focus not on how many ways I will miss Ciega, but how many days she filled with joy and resilience. How would Ceiga approach today and the next? She’d take every moment as it came, appreciate every pet and hug. And then, when she’d had enough, take the personal space she needed away from her bungalow mates. She didn’t pine for certain humans. She opened her heart to the next volunteer, intern and staff member. She wouldn’t want any of us to close our hearts or stay in a state of despair. Instead, she’d celebrate and feel joy about how much she was loved. She’d want us to share that love with other cats in need, just like her. She inspired us all each day she was here, and she’ll continue to do that for days and years in the future. Ciega, the loss we feel now mirrors the love we had for you. We promise to ensure we share that love with others – the way you would want us to. 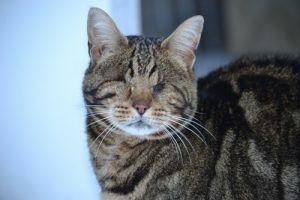 Being blind, you made us learn to see not with our eyes, but with our heart and soul. Thank you! We’ll hold you in our hearts forever. 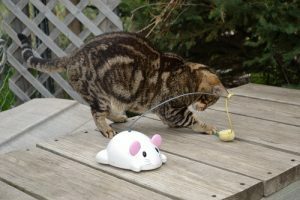 Ciega is a marbled domestic Bengal cat. She was born in 2004 and arrived at TWS in 2006. As far as phone calls go, the one I received years ago didn’t seem all that strange at the time. Another rescue group had been contacted by a private owner. He was having trouble with his Bengal cat not using the litter box consistently. We get these calls all the time since it’s such a common complaint about hybrid wild cats. He wanted to surrender her. And one more thing. There seemed to be a problem with her eyesight, too. I drove to pick up the cat, agreeing we’d take her in. 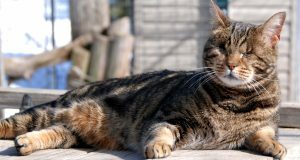 On the way, I called our vet to give a heads up this cat might have some eye issues we’d have to address. What I found when I arrived was rather shocking. This cat didn’t have poor eyesight. 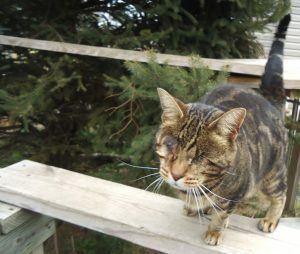 This cat appeared to have no eyes at all! From the minute I brought Ciega back to The Wildcat Sanctuary, she showed what a force she’d be. When I opened her crate, she began mapping her new world. She’d venture out a set distance, and return to her crate. Then, she’d go a bit farther and return. She did this over and over again, learning her way around so quickly. It turns out, Ciega was born with a birth defect known as microphthalmia. 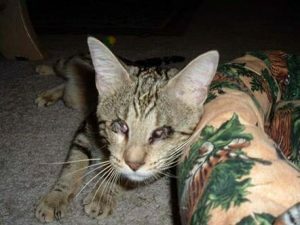 In this condition, one or both eyeballs are abnormally small. In some affected individuals like Ciega, the eyeball is so small it couldn’t be seen. But, even in these cases, some remaining eye tissue is generally present. 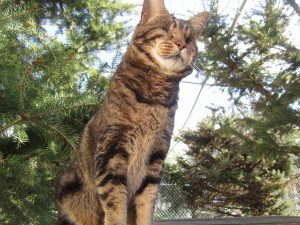 Ciega had surgery to close the open sockets where her eyes should have been. This eased the discomfort she experienced from having weeping eye sockets and lessened the chance for bacterial infections. Being the trooper she is, Ciega recovered well from her surgery. Today in 2018, Ciega’s 13 and continues to astound anyone who sees her. 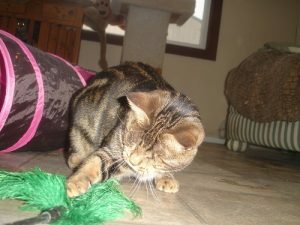 Watching her play, it’s hard to remember this cat has no eyes! 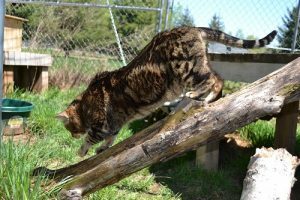 You’ll find her on the highest perch in her bungalow, jumping up to nap on high platforms in her outside habitat, playing on top of caves, interacting with her other bungalow mates – just about anything a sighted cat would be doing. Ciega may mean blind in Spanish, but don’t tell her that. She won’t know what you’re talking about! 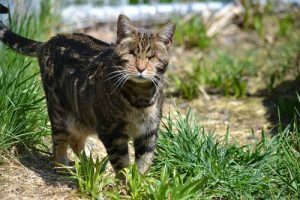 Ciega’s story is one of hundreds of miracles happening at The Wildcat Sanctuary every day, thanks to compassionate donations from supporters. Read about Ciega’s eye surgery and how all our supporters helped her.